Make It Right, the organization founded by celebrity Brad Pitt and architect William McDonough teamed up with BNIM Architects to convert an abandoned, historic school into LEED platinum affordable housing. Located in one of the most distressed neighborhoods in Kansas City, MO, the Bancroft School Apartments aim to catalyze urban renewal by providing low-cost housing with a negligible environmental footprint. Founded in 2007, the Make It Right Foundation was created to rebuild safe, energy-efficient and affordable housing for Hurricane Katrina victims in New Orleans’ Lower 9th Ward. Using the Cradle-to-Cradle philosophy, the organization has since expanded to help families in underserved communities across the country. 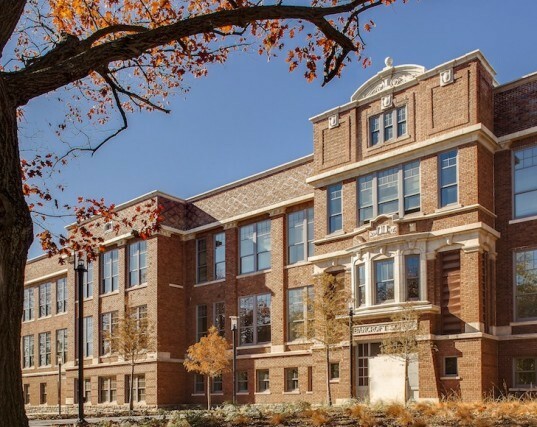 Abandoned for over 13 years, the Bancroft School has been transformed from a decaying eyesore into LEED Platinum housing that anchors the project as a model for change in a blighted neighborhood. In addition to fifty new rental units, adaptive reuse has resulted in a host of other new shared amenities including an auditorium, gym, computer lab, and community gardens. In addition to the 75-kilowatt solar array installed on the roof, the structure features high-performance windows and daylighting techniques to maximize energy efficiency. Bancroft’s original oak flooring was restored wherever possible. “Bancroft signals a catalytic shift in community revitalization,” said Bob Berkebile of BNIM Architects. “This effort has already resulted in a remarkable reduction in crime and increase in hope.” Totaling $14.3 million in costs, the Bancroft School Apartment project was funded by various private donors as well as federal and state low-income housing and historic preservation tax credits. I am retired and would like to do what I can to help. My nephew needs housing and ould use his place as a drop off fo donations non money. I have the land. There is a recycling organization alled Terracycle. It will recycle old tooth brushes Layes potatochip bag for 3 d printer pellets the bag linners of cereal boxes. The pouches of enntermand little bites muffins. It has to bshipped in to atleast 5 pounds at a time but wont have stuff just stacked up. You can set it up anywhere. Check it out or price me how much it would take. He is a painter by trade and he knows dry wall and other building skills.I am located in Tennessee. Abandoned for over 13 years, the Bancroft School has been transformed from a decaying eyesore into LEED Platinum housing, anchoring the project as a model for change in a blighted neighborhood. In addition to fifty new rental units, new community amenities such as an auditorium, gym, computer lab, and gardens boost the project . 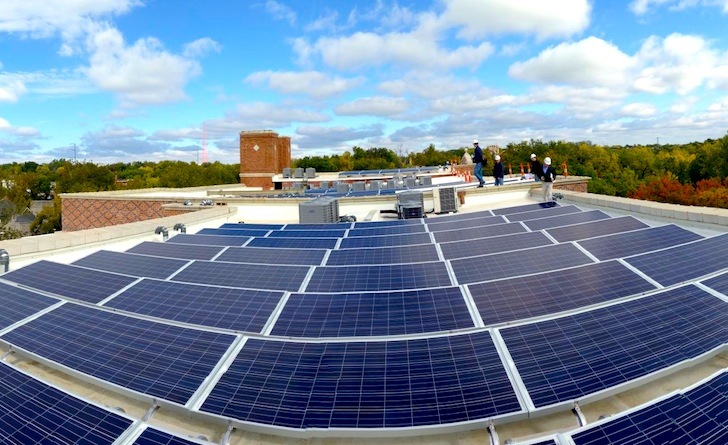 In addition to the 75-kilowatt solar array installed on the roof, the structure features high-performance windows and daylighting techniques to maximize energy efficiency. BNIM Architects designed new townhouses around the perimeter of the school. Totaling $14.3 million in costs, the Bancroft School Apartment project was funded by various private donors as well as federal and state low-income housing and historic preservation tax credits.